Nearly two years after his last competitive outing, Astros right-hander David Paulino is soaking up the spotlight. "This is a kid who lives to go out and compete. He likes the big stage. He wants the attention," said Class A Short Season Tri-City pitching coach Chris Holt. "He likes to be the man to do what he can do -- for him to come out and pitch in front of the crowds, he's loving it." 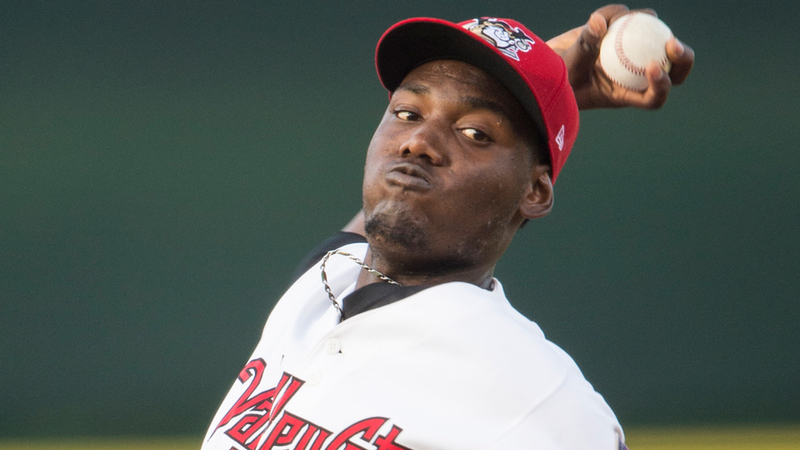 Paulino set the tone as the ValleyCats one-hit the Staten Island Yankees in a 6-0 victory Thursday, refusing to allow a base knock over 4 1/3 innings while striking out six and walking two. Zach Davis extended the no-hit bid over two-thirds of an inning, Trent Thornton allowed a single and fanned four over three frames and Juan Santos shrugged off two walks to turn in the ninth. "They were following their plan of attack, executing well for the most part," Holt said. "They got into good pitching rhythms." It was Paulino's second scoreless start in the Houston organization -- the 21-year-old hurler came to the team from Detroit to complete the 2013 Jose Veras trade, but missed all of last season after being shut down for Tommy John surgery following a July 13, 2013 Gulf Coast League outing. In his return to action Saturday, he scattered four hits and fanned four at Connecticut. "I would say he was equally sharp [tonight]. Early on, he was getting ahead for the most part and he picked up steam as he went along," said Holt. "He was locating his fastball and locating his changeup, getting the changeup to the floor for an out pitch on a couple occasions. He was able to stay on the attack and as he picked up steam and was throwing a lot harder, there was just no chance. His stuff is tremendous. He looks like he's toying with guys at times. He hits 92, 93 miles per hour on the fastball, and then he can reach back and get up to 98." The native of Nizao, Dominican Republic walked one in the first two innings, but was perfect in the third and fourth, retiring eight in a row into the fifth. With one out in that frame, Drew Bridges reached on a fielding error by second baseman Kolbey Carpenter. Paulino then made a fielding miscue to put Eduardo de Oleo aboard, and he hit his pitch count during that at-bat. "We have limitations we have to work within," Holt said, "but, no doubt, at some point this season he's going to work his five innings well within his pitch count." With one out and runners on first and second, 23-year-old southpaw Zach Davis entered and induced a double-play ball off the bat of left-handed hitter Ryan Krill. "That was awesome. That was the life of a left-handed specialist," said Holt. "That was exactly what we needed. He came in and threw three excellent pitches and he got the job done." Thornton, a 2015 fifth-round pick out of the University of North Carolina-Chapel Hill, only gave up a one-out single by the Yankees' Griffin Gordon in the seventh. He earned the win, which was his first decision in two pro appearances. "For Thornton, he's a three-year college guy, so he knows how to do some things," Holt said. "For him, it's just executing pitches. He's got the stuff, and once he gets ahead, he's tough. If you're going to get to him, it's going to be because he got behind in the count. The bottom line tonight was that he showed tremendous stuff with command." Juan Santos walked the first two batters he saw, but he set down the next three in order to close the door. His pitching coach was thrilled to see the 19-year-old righty work out of the jam. "No question," Holt said. "Santos is a kid with a ton of potential. To come in and struggle a little bit early throwing strikes and putting guys away, and then to be able to finish that inning and end the game the way he did was excellent." Johnny Sewald, the Astros' 14th round-pick this year, went 3-for-4 with three RBIs for the ValleyCats.